WASHINGTON (CNS) — Some carried cards with a photo of St. Teresa of Kolkata or Blessed Oscar Romero and stood near the U.S. Capitol on the feast of All Saints Nov. 1, calling on politicians who call themselves Christian to act as Jesus would when shaping laws that affect migrants. “To the senators and representatives who call yourselves Christians … the Bible says that that which you do to the most marginalized among us, you do to Christ himself,” said the Rev. Jennifer Butler, CEO of Washington-based advocacy group Faith in Public Life. She was one in a crowd of more than two dozen religious leaders gathered outside of Congress to primarily call on politicians to pass — and pass soon — legislation to help youth who were brought to the U.S. illegally as minors. However, like others in the group, she also spoke about a general sense of discrimination toward many other immigrants in the country. She called on politicians to avoid using a bill that would help the young migrants to hurt other groups of migrants. The group asked lawmakers to pass the Development, Relief and Education for Alien Minors Act, or DREAM Act. In theory, the measure would help youth and young adults, brought illegally into the country as minors, attain some form of immigration relief. Though first introduced in 2001, the bill has never passed, but many see it as the most promising way for some 800,000 youth who are in the country illegally and who, until recently, could apply for a work permit and a reprieve from deportation under the Deferred Action for Childhood Arrivals program, known as DACA. The program was put into place in 2012 by then-President Barack Obama. Some believe that the only way politicians will pass the DREAM Act is in exchange for more money to fund a border wall with Mexico or for more federal money for actions that supporters of the bill say would harm migrants. But the religious leaders who gathered outside Congress said such funding measures not only treat the young migrants as pawns and also are not actions worthy of the men and women serving in Congress who call themselves Christian. Congresswoman Lucille Roybal-Allard, D-California, one of the co-authors of the DREAM Act, stood with the group to deliver a message to Trump and others. “Mr. President, Scripture tells us to love our neighbors as ourselves. By breaking up families and upending the lives of Dreamers, you and (House) Speaker (Paul) Ryan are not being good Samaritans,” she said. Patrick Carolan, executive director of the Washington-based Franciscan Action Network, had stronger words for Republican House Speaker Ryan, of Wisconsin, and for other politicians who publicly proclaim their Christian faith but back laws that hurt migrants. 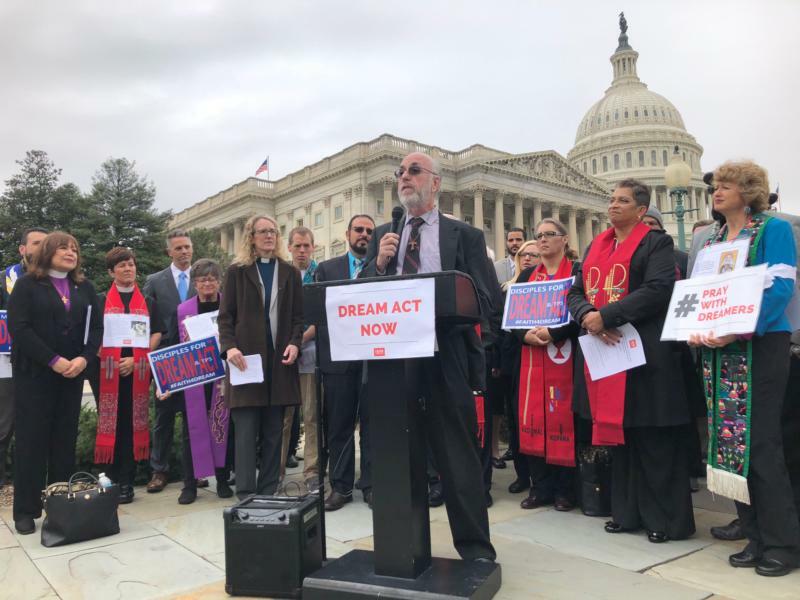 “We’re called by our faith to welcome the stranger … most of our members of Congress claim to be Christian, they claim to follow the teachings of Jesus,” Carolan said. “Many, like Paul Ryan, claim to be Catholic, like myself. But I have to tell ya, I’m very angry that they have hijacked my faith, they have tried to turn my faith into a faith of hatred, a faith of racism, a faith of fear of the other. They’re not following the Gospel of Jesus. They’re following the Gospel of Ayn Rand,” Carolan said. Rand was the 20th-century philosopher who supported the belief that no taxes or government regulations would produce the highest good. Her writings are popular among some conservatives. “It’s time that they stop pretending to be people of faith and started living as people of faith,” said Carolan. Imam Yahya Hendi, Muslim chaplain at Georgetown University, said there was one reason all the faith leaders had gathered at such an urgent moment. “I am proud to say I am here today united with people from all religions because we must be here for each other to make sure we are creating a kingdom that leaves no one behind, no matter religion, ethnicity or where they were born,” he said. And houses of worship and religious leaders such as the ones at the gathering, he said, are the “first responders” for the most vulnerable in society at the moment.